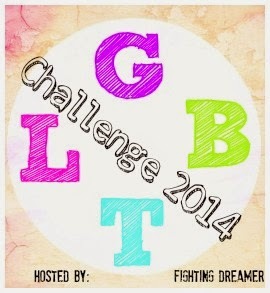 Uh, I've kind of already managed to complete this challenge before I even joined; that's how much I love LGBTQ books. I've managed to review 3 LGBTQ books in as many weeks since I started this blog, and I hope to review many more. Up next on my list is probably Adaptation by Malinda Lo. I'm also planning to read Aristotle and Dante Discover the Secrets of the Universe by Benjamin Alire Sáenz, Two Boys Kissing by David Levithan-- and after that, who knows? I really love LGBTQ books, you guys. As you can probably tell. I can never stop talking about them. They really helped me as I was growing up. I might do a post later on this month talking about some LGBTQ books I've read in the past that I've really liked, as well as a post on LGBTQ books that will be published this year that I'm excited about. I will be updating my progress on this challenge on my 2014 Challenges page! "can never stop talking about them." Haha, I'm the same. And I'm planning to do a post on the LGBT books that have influenced me the most next week. I can't wait to read that book. I've heard so many good things about it. I'm looking forward to that post! With you being my first commenter and all, I've realised how terrible the commenting system that comes with Blogger is, so I've switched over to Disqus, but now this page looks like a mess. Oh well. At least it should look better from now on. Thanks! (: Jellyfish are certainly adorable. I still haven't watched Princess Jellyfish though. I hear it's good. There's so little time to do everything that I want to do! Your blog is pretty awesome, Cynthia! Welcome to the blogosphere! I look forward to all of your LGBTQ-centered posts and just your posts in general. I also really like LGBT books-- they have helped me to grow more understanding and accepting, I think. By the way, I saw your review on The Miseducation of Cameron Post (will make a long comment on it during my next comment-binge) AND I LOVED THAT BOOK TOO! I'm queer myself, so while I was growing up LGBTQ books really helped me through those times when I felt lonely and afraid. I'm glad to hear they've helped you in a different way. Looking forward to your thoughts on my review on Miseducation! That book was so awesome, wasn't it?